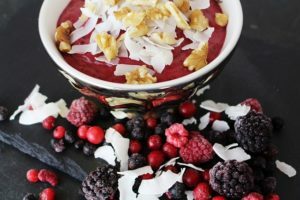 Home yogic life	How to make your own smoothie bowl! 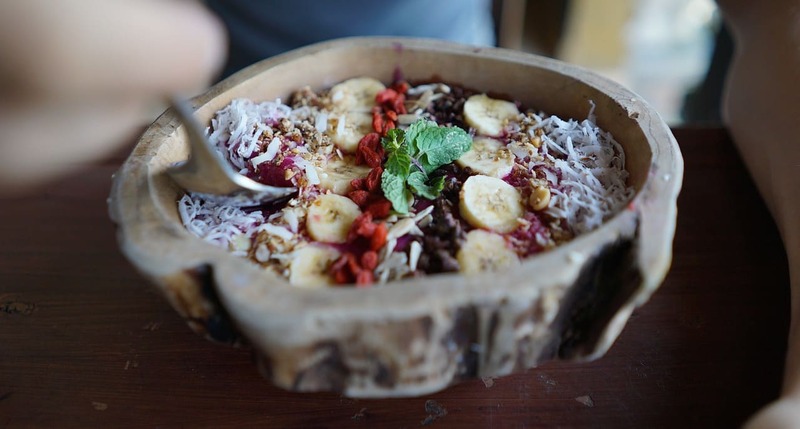 Smoothie bowls are the new chia pudding. They are healthy, full of vitamins and soooo yummy. I found them on my travels throughout Bali. They are everywhere. They just belong to the new era of vegan-yogi-hipsters. I am always looking for healthy breakfast recipes replacing the big amount of carbohydrates in bread, pastries or even cornflakes and cereals. Instead I prefer for my mornings a metabolism a immune system booster. And a fruity Smoothie Bowls is a good alternative to my warm Ayurvedic breakfast bowls (still my favorite). Especially in summer you just want something cooler. And my partner same. He loves smoothies. But now he can enjoy them for longer than 2 minutes. And they keep him satisfied for longer due to the topping you add. So how can you make your own Smoothie bowl? It’s super easy. And variations are endless. For your smoothie base, choose the fruits you like/have and blend them in a mixer. To make your smoothie thicker you can add cereals like oats or flax or chia seeds (soak them before!). But also adding yoghurt or simply thicker fruits like bananas and avocados often is enough. Experiment by yourself. DON’T FORGET: Add some oil to take advantage of the fat-soluble vitamins (A,D,E,K). My favorites oil are those of pumpkin or flax seed, walnut and coconut. You see it’s super easy to make your own smoothie bowl, just in a few minutes. It’s rich in nutrients, vitamins and minerals. There’s no rule. Combine whatever you like and allow your creativity to flow! Need some inspiration? Have a look on instagram #smoothiebowl!